If your mother was born on Jan. 30, you forgot to wish her a happy birthday yesterday. If she was born today, the 31st, she shares a birthday with Mario Lanza, and you still have time to send her an e-card. The operatic tenor Mario Lanza made great contributions to oldtime radio. 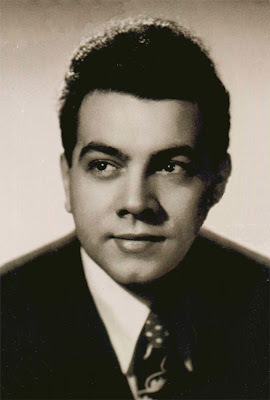 His radio show, entitled simply "Mario Lanza," ran for a dozen or so episodes from Summer of '51 into '52. It was an elegant offering of Lanza's singing and great guest stars such as Rosemary Clooney, Vesti La Giubba and Kitty Kalen. Episode titles include "I've Got You Under My Skin," "All The Things You Are," and "Night and Day." While Lanza was considered to have one of the very best singing voices on Earth, he also had a somewhat rocky career marked by skirmishes with colleagues and bosses. He endured a small lip-synching scandal in 1954 when it was revealed he'd been miming on his TV debut, and he snubbed the New Frontier in Las Vegas for a two-week gig. Lanza was a lover of food and drink, and died of a heart attack in 1959. He was 38. My fireside chats usually center why these new-fangled lighters are so hard to use, but our 32nd president had something else in mind with his. Since today commemorates the birth of FDR, let's take a look at his famous fireside chats. There were thirty-one in all, from 1933 to 1944. These fireside chats were radio addresses to a nation first in the grips of the Great Depression and then embroiled in World War II. The name was meant to suggest informality, casualness, all of us as equals with the president. The first was on March 12, 1933, and it dealt with the banking crisis and the country's economic travails. The second one outlined the New Deal Program, and others dealt with a 1936 drought, "the European War" (Sept. 3, 1939), the declaration of war with Japan (Dec. 9, 1941), the progress of the war (Feb. 23, 1942) and other topics, usually controversial, important, and timely. Not a lot of historians and analysts over the years have argued that a policy of ignoring the American people and keeping them in the dark is really the way to go. No, the chats have been universally popular, and are considered influential in laying out a paradigm for the communication duties of elected officials. FDR is generally considered an outstanding speaker. One man was quoted of saying that as a result of the chats, his "mother looks upon the President as someone so immediately concerned with her problems and difficulties that she would not be greatly surprised were he to come to her house some evening and stay to dinner." 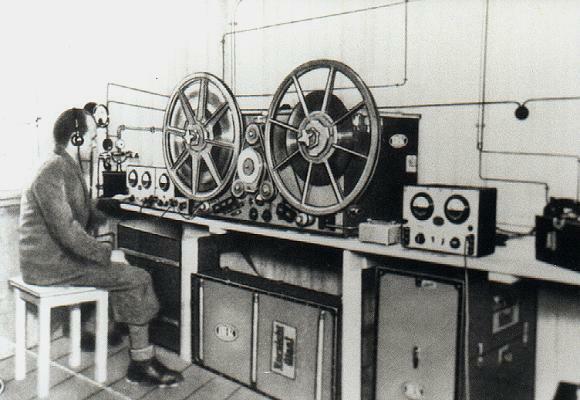 January 27, 1948: The first magnetic tape recorder was introduced by Wire Recording Corporation of America. ‘Wire Way,’ as it was called, had an integrated oscillator and was sold for $149.50 at the time. 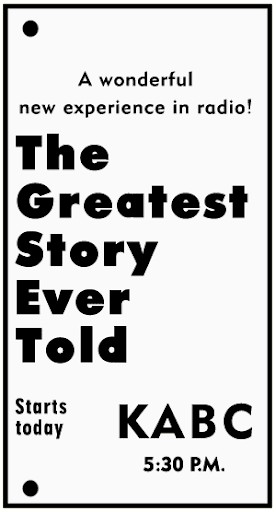 January 26, 1947: The Greatest Story Ever Told debuted on ABC. The Greatest Story Ever Told was a biblical drama series based on the life of Jesus Christ. It was the first ever program that featured him. Warren Parker played Jesus Christ, although it was not announced by the radio station. Other personalities who starred in the show were also anonymous. During the series' entire run, the station decided that there would be no pictures of the performers, no live audience, and even no commercials. The show had its last episode on December 30, 1956. January 25, 1944: White actor Marlin Hurt made his first appearance as a black maid, Beulah, in Fibber McGee and Molly. Later on, the character Beulah itself became a radio series in 1945. January 24, 1942: Famous comedy Abie's Irish Rose was first aired on NBC as a stand-in for Knickerbocker Playhouse. The show was based on the hit production from Broadway, and it continued for approximately 2,000 episodes. Sydney Smith appeared in the title role of Abie while Rosemary Murphy was played by Betty Winkler. Abie's Irish Rose was written by American playwright Anne Nichols. It featured the story of an Irish girl who, despite the disapproval of her family, married a young man of Jewish descent. It lasted for more than two years, with the last episode airing on September 2, 1944. January 21, 1946: ABC debuts 'The Fat Man'. January 21, 1946: ABC introduced the The Fat Man, starring J. Scott Smart as the portly detective. He weighed in at 270 pounds in real life. The show was part of a crime series block that included broadcasts of I Deal in Crime, Forever Tops, and Jimmy Gleason's Diner. Labels: ABC debuts 'The Fat Man'. 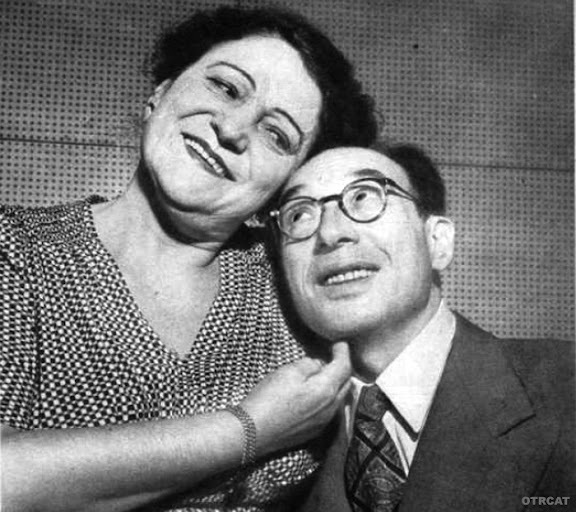 January 17, 1938: The radio soap opera Stepmother make its debut on CBS on this day and lasted for 15 years after. 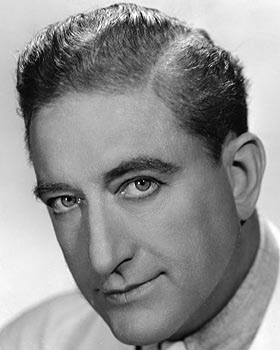 The show was starred by Francis X. Bushman who was an actor, screenwriter, and film director. Just like most of his contemporaries, he started his career as a stage actor and then eventually moved to filming in 1911. 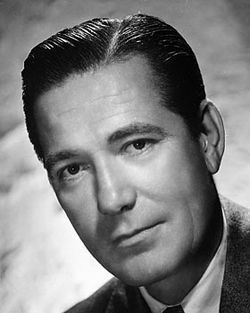 After his film career had faded, Bushman starred on a soap opera by the CBS radio entitled Stepmother. The show lasted for four years, from January 17, 1938 to July 10, 1942.